Cruising along the 'Swich waterfront past Colours and Isaacs last night, I slammed on the passable brakes on the temporary Holywells Park bike. There, squeezed twixt Pizza Express and the Waterfront Bar, was a new-to-me eatery. That's going on the list. Next day and winding-down Andy's nabbed a prime parking spot near the Salthouse. Sweet. On the short stroll back, we passed a gaggle of important looking business folk including new town MP Sandy of Ipswich. Mildly starstruck, on we strode to The Grazing Sheep. 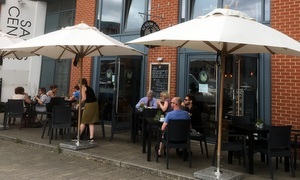 Most pleasant outdoors but all tables taken. No matter, in we go and upstairs to window seating offering the perfect opportunity to people watch. Already impressed by the decor and atmosphere within. Downstairs to order and there's many tempting options. Shirley Valentine Kev goes for the Greek salad, Andy takes a toastie and I'm a falafel fiend. Add to that the obligatory San Pellegrino and a Colada Crush for our driver. Seems full of life, this place, and our plates arrive via a handy dumb waiter. That's some good looking grub. Very, very good. Gotta get back, alas and alack, so a takeaway coffee it has to be. Gutted to miss out on the sweet stuff. Open for breakfast until late afternoon with the odd late closing thrown in over the summer months, this Sheep's a keeper. I will return to the fold. If it was a car -- Lambretta Super Comtesse. If they were passing by -- Nick Park.